Set in 28 acres of gardens and parkland, Kingscote Park House is a stunning Regency house with eight beautiful double bedrooms. It is decorated in a classic style and has a welcoming and relaxing ambience - perfect for family and friends that want to celebrate in style. It has a large kitchen, dining room, drawing room, music room and a library/tv snug and a retro jukebox in the hall. Thanks to the well-equipped kitchen, the option is there for guests to cater for themselves. Alternatively, we'd be delighted to provide meals to suit your requirements. Kingscote Park is also available for weddings with the adjoining Matara Centre providing a very special setting with its cloistered courtyard and light and airy glass-domed celebration room. Set in 28 acres of gardens and parkland, Kingscote Park House is a stunning Regency house with eight beautiful double bedrooms. It is decorated in a classic style and has a welcoming and relaxing ambience – perfect for family and friends that want to celebrate in style. It has a large kitchen, dining room, drawing room, music room and a library/tv snug and a retro jukebox in the hall. Thanks to the well-equipped kitchen, the option is there for guests to cater for themselves. Alternatively, we’d be delighted to provide meals to suit your requirements. Kingscote Park is also available for weddings with the adjoining Matara Centre providing a very special setting with its cloistered courtyard and light and airy glass-domed celebration room. The elegant Regency Kingscote Park House combines the atmosphere of a relaxing family home with the classic style of a country house hotel. Its eight double bedrooms overlook Matara’s gorgeous parkland. Kingscote Park House is not just available for whole house rental but is also a venue for weddings and celebrations and can be rented with the adjacent Matara Centre; built on earth-friendly principles it provides the perfect setting for you to celebrate in a personal and individual way. Kingscote Park House is a stunning Regency house with eight beautiful double bedrooms. It is decorated in a classic style and has a welcoming and relaxing ambience – perfect for family and friends that want to celebrate in style. It has a large kitchen, dining room, drawing room, music room and a library/tv snug and a retro jukebox in the hall. Thanks to the well-equipped kitchen, the option is there for guests to cater for themselves. Alternatively, we’d be delighted to provide meals to suit your requirements.Kingscote Park House is a welcoming home, perfect for bringing family and friends together in luxury and comfort. Regency elegance complete with real fires, a well-stocked library, chandeliers and roll-top baths. The original gatehouse for Kingscote Park, the Lodge is a romantic hideaway for two set in its own Japanese-inspired tea garden. This luxurious retreat has a king-sized bed, Jacuzzi bath, television and kitchen. The gardens have been designed to provide a place for peaceful contemplation. 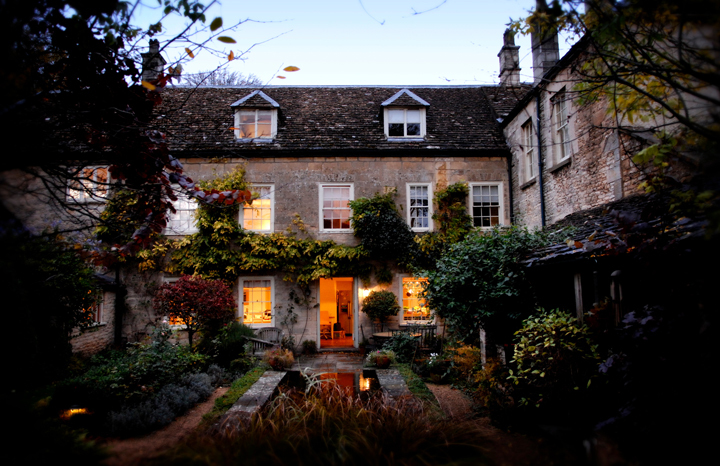 They are featured in Tony Russell’s book, “The Cotswold’s Finest Gardens”. A stroll through the Gardens takes you through woodlands and open parkland as well as Eastern-inspired settings in the Chinese scholar’s garden and Japanese tea garden. There are delightful features at every turn including the Celtic wishing tree, the healing spiral, the large labyrinth and the walled herb garden.